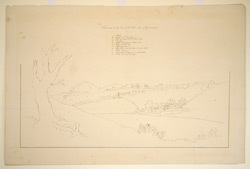 Pen-and-ink key drawing to accompany a view of the west side of Gandikotta Fort from the west bank of the Pennar river by Thomas Fraser (1776-1823), c.1802. Fraser served with the Madras Engineers from 1796 to 1819. during 1802 he appears to have been inspecting and surveying forts in the Ceded Districts of Bellary, Kurnoo, Anantapur and Cuddapah. This famous ancient fortress, otherwise known as ‘The Fort of the Gorge’ is situated in the Cuddapah district, Andhra Pradesh in a strategically important position at the head of the Pennar valley. It overlooks the Pennar River 300 feet below and is surrounded by impassable hills adding to the natural defences of the site. The fort was built in 1589 and later captured by Golconda but was subsequently absorbed by the Pathan Nawab of Cuddapah. It was later strengthened by Haider Ali but fell to the British under Captain Little from Tipu Sultan in 1791.